England Under-17 and Liverpool striker Rhian Brewster claims he has been racially abused or witnessed abuse of a team-mate seven times, including one alleged incident in the Under-17 World Cup final. Brewster is still to make his professional debut for the Reds but the World Cup winner has told The Guardian he has been targeted during games, with five of the alleged incidents in the last seven months. Liverpool submitted an official complaint after playing Spartak Moscow in the UEFA Youth League tie at Tranmere's Prenton Park three weeks ago after one alleged incident. And Brewster - the Golden Boot winner from England's victorious World Cup campaign - has opened up in a wide-ranging interview. "I jumped to my feet and the ref came running over because obviously he realised something had been said. He (the referee) said to me he couldn't do anything because he hadn't heard it and 'the only thing I can do is report it'. "I said: 'Come on, then - let's go and report it.' He started doing something else and I said: 'No, now.' We went over to the fourth official and told him. I told Steven (Gerrard, coach) what had happened and we made a complaint there." Spartak captain Leonid Mironov is the player accused of that abuse, but he denies the allegations and Brewster is waiting to find out a date for a UEFA disciplinary hearing. 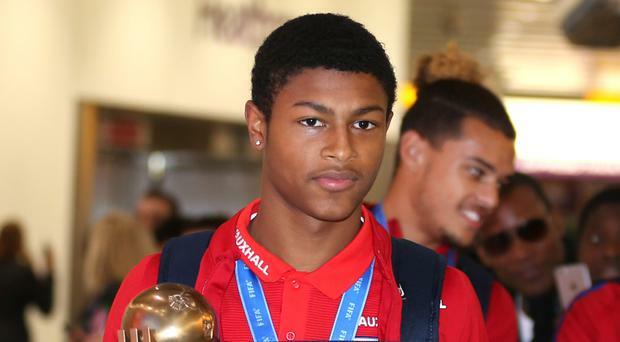 Brewster also claims he was called the same name in a European Under-17 Championship against Ukraine in May and while playing against Sevilla for Liverpool's Under-19s. In the Under-17s World Cup final, Brewster said Wolves midfielder Morgan Gibbs-White was the target of vile racist abuse. "Something happened in the box," Brewster said. "As Morgan was running away, he (a Spain player) has called him a monkey. It was a goal-kick and I was getting into position. And Brewster admitted the impact that such racist abuse has on him. "On the day it happens, that night my head won't be there. I just want to be left alone," he said. "I want to be by myself and left to think. The next day I'll still be thinking about it. "I don't think UEFA take this thing seriously. They don't really care. That is how it feels anyway, like it has been brushed under the carpet." Kick It Out, football's equality and inclusion organisation, hailed the teenager for speaking out. "An incredibly brave @RhianBrewster9 speaks out on the racism he has suffered during his career so far. It is time for the relevant authorities to act on this unacceptable behaviour," the organisation said on its official Twitter feed. UEFA has been asked for comment. In its rules the governing body says anyone found guilty of racist abuse faces a suspension of at least 10 matches.